The Instant Pot Ultra 10-in-1 is an electric pressure cooker that can hold 6 quarts. 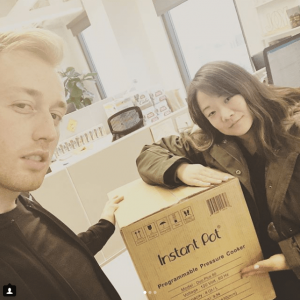 This is the newest cooker of the Instant Pot brand that has people talking. It is jam-packed with lots of customization features which have never been seen in an electric pressure cooker before. The Instant Pot Ultra 10-in-1 is just what the name indicates, ten appliances in 1 machine. After testing the Instant Pot Plus DUO60, we thought that was the best pressure cooker we have ever seen. However, this opinion changed after we tested the Instant Pot Ultra 10-in-1 and saw how awesome its features were. This model changes how normal pressure cookers function. It lets you create unlimited programs with very little effort. There are lots of benefits and advantages to using the Instant Pot Ultra 10-in-1 programmable pressure cooker. It is such a superior kitchen appliance because it can take the place of 10 other kitchen appliances. This not only saves you money, but it saves you time as well. 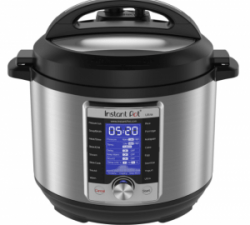 All the features from previous Instant Pot versions are included with this Ultra model. In addition, there is a new bigger digital display screen along with an easy-to-use management system. This takes most of your worries away while cooking. The Instant Pot Ultra has a cooking process indicator. This tells you how much processing your food has gone through. Then you will know how far along you are in preparing your meal. The power cord can be removed as well, allowing you to store the cooker easily. You will notice a new feature called “Ultra” included with the Instant Pot Ultra 10-in-1. Ultra is a feature which lets you preset the pressure cooker so a specific temperature and cooking time. There are two pressure choices available too. The controls might be difficult to understand from a description, but once you start physically using the cooker, then it will get easier to figure out. Its ten appliances in 1 are just the beginning because there are thousands of useful tools in this one machine as well. Of course, you can expect the standard features like sautéing, pressure cooking, yogurt making, warming, sterilizing, steaming, rice cooking, temperature setting, and slow cooking. Okay… now listen. The Ultra function might sound great from all the commotion and advertisements about it. Just know that it cannot cook foods at simply any temperature or pressure that you want. Even though the Instant Pot Ultra 10-in-1 has a pressure option, the only two options are high pressure and low pressure. You can pressure cook your food for 6 hours or less if you have pressure on. If you are using a customized temperature with no pressure, which would be anywhere from 104°F to 208°F, then you can cook for 99.5 hours or less. If you want to pressure cook something for over 6 hours, then you will need to use the “Keep Warm” function after the cooking is over. This will slowly cook the food for an extra 24 hours. There won’t be any pressure cooking here, but there will be enough warmth generated to allow the cooking time to go longer. The Instant Pot Ultra is designed to appear cleaner and more attractive. There is a large LCD display screen which has a push dial, start button, and cancel button. You might think this looks more primitive than past Instant Pot models because there is no way to switch between programs quickly. For instance, to access the sauté program, you must use the dial button to scroll through the list of programs to find the sauté program. To choose the Pressure Cook function, the Cancel button must be pressed first. Then you need to scroll with the dial button until you find the Pressure Cook option. Therefore, the Instant Pot Ultra makes you go through more steps to choose a new program. This will be a little annoying, but maybe the company will fix this issue in their next release. We believe the Instant Pot Ultra should have program buttons that you can push. There should also be a + button and – button too. If these features can be included in the next model, then we will be happier. On the upside, we do like the New Progress Indicator which displays lots of helpful information. There is even a graph which displays the current stage in which the cooker is in. Other Instant Pot versions required you to twist the venting knob in order to seal the pressure cooker. If you wanted to let out the steam, you’d have to twist the venting knob the other way to the venting position. With the new Instant Pot Ultra pressure cooker, the steam release valve automatically seals after you put the lid back on. If the quick release button is pointed in the upward direction, this means it is sealed. Alternatively, you can twist the button in a counter-clockwise direction, and the steam release valve will seal. If you want to do a Quick Release and let out pressure, just press the Quick Release button. There should be a click sound, indicating the venting position is locked n place. If you continue pressing the button further down, all the steam pressure will come blasting out quickly. If you only push the button down slightly, then a little bit of pressure will come out. The steam release control is a powerful feature. For anyone who forgets to twist the venting knob and seal the lid, you will love this new automated feature. If the Instant Pot has boiling liquid on it and you attempt to close the lid, then the Quick Release button will need to be pressed. This is part of the Instant Pot Ultra’s safety feature which activates the locking mechanism automatically. 10 Appliances in 1 – These appliances include a sterilizer, warmer, steamer, egg cooker, yogurt maker, cake maker, rice cooker, sauté, slow cooker, and pressure cooker. Dial – Just spin the dial until you find your desired setting. Push the button to select it. Custom Options – The appliance lets you customize your options for most of its features, such as the pressure, temperature, cooking delays, and when Keep Warm should occur. Cooking Progress Indicator – The display indicator shows the cooking progress. It is easy to figure out what it means because the progress will be either Keep Warm, Preheat, or Cooking. Memory – Once you adjust the settings, the appliance will remember them for the next time you use it. These could be settings pertaining to temperature, pressure, and time. Automatic Weighted Valve Closing – After you open or close the pressure cooker’s lid, the sealing position will be reset automatically. Mute Sounds – If you don’t like the sounds of the beeps when you press buttons and see alerts, then you can turn off these sounds. Change Altitude – Pre-programmed times can be changed so that the pressure cooker won’t time-out prior to high altitude cooking. Two Sensors – There is a pressure sensor and temperature sensor to give you accurate information. Two Pressure Choices – Delicate pressure and full power pressure. Slow Cooker – Three settings are available; low, medium, and high. You can also choose a custom temperature of your own. Sauté – Three settings are available; low, medium, and high. You can also choose a custom temperature of your own. Inner Pot (Stainless-steel) – Few pots have a stainless-steel inner pot like this one does. There are three layers of aluminum at the base too. Handles – Use the handles to hold the lid when you have a steamy hot cooker. The programs available include egg, cake, multigrain, porridge, rice, chili, bean, stew, meat, broth, and soup. The Instant Pot Ultra is similar to other Instant Pots on the market because the pressures and cooking times are present in every program. Instant Pot did this because they recommend these settings for cooking certain types of foods. Fortunately, you can adjust the pressure and cooking times to the available options of the program. The steam function can steam foods at no pressure, low pressure, or high pressure. The time can be anywhere from 0 minutes to 240 minutes. If you want to steam vegetables, then choose “no pressure.” But to pressure cook them and save time, you can put “0:00” for the cooking time and choose low pressure. Once the low pressure is reached, the cooker will immediately beep and allow the vegetables to be quickly freed from the heat. If you choose the Slow Cook option, you can slow cook food for at least 30 minutes or as much as 20 hours. The temperature settings available are low, medium, high, and custom. The difference here is 185°F, 194°F, 208°F, and 104 to 208°F; respectively. Slow cooking is recommended if using a glass lid that comes separately. Some consumers claim that slow cooking with the Instant Pot pressure cooker causes reduced evaporation and undercooked food. The Instant Pot Ultra does this too. The reason can be attributed to the new thermostat-managed slow cookers which have replaced the classic wattage-managed slow cookers. There is also a big difference in the way heat is distributed in ceramic inserts versus stainless-steel ones. To achieve the same results as a traditional slow cooker, activate sauté mode to boil the contents before closing the lid. Once that is done, turn on seal mode for the pressure valve. This will distribute heat better throughout the cooker. Try to obtain an additional aluminum ceramic-lined internal pot so that you can better duplicate a classic slow cooker’s vertical heat circulation system. The Instant Pot Ultra has a stainless-steel insert with an aluminum disk that is only on the base. Because of this, heat doesn’t distribute evenly throughout the sides. You can only set the cooking time for 1 to 30 minutes for the sauté function. The temperature options are low, medium, and high. This is 275°F to 302°F, 320°F to 349°F, or 347°F to 410°F; respectively. You need to understand how important it is to increase the temperature of the sauté, regardless of which Instant Pot model you have. For the Instant Pot Ultra, changing the temperature in sauté mode is difficult due to the dial interface update. With previous models, users simply needed to click “sauté” and then tap the adjust button twice. The new Instant Pot Ultra is different because you need to turn the dial and tap to select “sauté.” Then you need to turn the dial to the desired temperature and tap again to select. Finally, turn the dial to “high” and then choose it by tapping. Press start to begin. As you can see, this feature should be improved. Previous models of Instant Pot had the setting “Keep Warm / Cancel.” This has been replaced with the Warm mode in the newest model. Warm mode can be adjusted to Low at 185°F, medium at 194°F, high at 208°F, and custom at between 104°F and 194°F. The custom setting has some issues, though, because the temperature range can’t be programmed to go as high as the present. Four hours is the maximum time you can set for sterilize mode. Your pressure options include high pressure, low pressure, or no pressure. Some website listings for this product claim the Instant Pot Ultra is suitable for canning foods. However, the USDA has not tested this product model to determine whether it is safe for canning or not. – The Low setting is meant for pasteurizing milk. – The Medium setting is great for boiling water and canning tomatoes, acidic fruits, jellied foods, pickles, etc. – The High setting is high pressure which can sterilize utensils, baby bottles, etc. There are no details from Instant Pot about how to use this function. Their website doesn’t have any information about using the function either. Plus, they recommend low pressure for this setting which is strange. Therefore, for safety reasons, just use sterilize mode for only utensils and nothing else. Most Instant Pot Ultra users love the yogurt maker function. There are three settings available; Low for fermentation at 91°F, Medium for the incubation of yogurt at 107°F, and High for boiling milk at 181°F. There is even a custom option which can go between 104 and 176°F. But the minimum of 104°F doesn’t even match the 91°F of the Low setting. Primary Safety Release Valve – Pressure will be released once the internal pressure goes over 15.23 psi. • Anti-Clog Vent – Stops food debris from clogging up the vent. • Safety Lock for Lid – Cooker cannot be accidentally opened when it is being pressurized. Electricity is not needed for it to function well. • Detects Lid Position – Determines if the lid is in a position that is not safe for pressure cooking. • Temperature Sensor – The cooking temperature is tracked. Keeps the temperature in a range that is safe. • Burn Prevention – Tracks high temperatures as the cooker heats up, keeps warm, sautés, and in any of the other programs. Prevents the burning of the food. • Pressure Sensor – Make sure the pressure stays in a safe range. • Temperature Fuse & Electric Current – Power turns off automatically if the internal temperature or electric current goes over the limits for safety. • Pressure Release (Last Resort) – If the main pressure managing valve stops working, the release of additional pressure goes into the cooker’s body (in the middle of the inner pot and outer lining). • Detection of a Leaking Lid – If there is a leaky lid on the pressure cooker, it will be able to detect this. • Quick Release Button – The valve is put in a locking position automatically. Most Instant Pot models have ten different safety systems. The Instant Pot Ultra has an additional Quick Release Button. When you have an opened or closed lid, you can reset the position with the Quick Release Button. This is great if you happen to be cooking and have the vent left open by accident. The offset button prevents your hand from making contact with the pressure valve. This adds more security to the pressure release because the risk of danger to you is limited. The Instant Pot Ultra is excellent, but some things could be better. Despite it being a 10-in-1 appliance, there are indeed more versatile cookers on the market. The Ultra doesn’t have certain features that other products have, such as a setting to adjust the temperature. • The dial interface can be annoying. • Automated programmable resets are not there. • There is little instructional information in the guide manual. Is it a good purchase? The Instant Pot Ultra 10-in-1 gives you a great combination of flexibility and versatility. The price is affordable too. If you already own an Instant Pot pressure cooker, there are some new features in the Ultra which might make you want to upgrade to it. If you’ve never owned an electronic pressure cooker before, then make the Ultra your first one. You will enjoy the advanced features, including the safety and warranty aspects of the appliance’s brand. The Instant Pot Ultra has the latest innovative settings and additions to make it more convenient, such as the detachable power cord and the drip catcher. Whether you are new or experienced at using pressure cookers, you will like the Instant Pot Ultra. The Instant Pot Ultra 10-in-1 programmable pressure cooker has gotten plenty of positive reviews from customers already. So many people are saying how well this appliance helps them with completing different cooking tasks in the kitchen. Although, some people indicate they’re not happy with the dial button interface. They say adjustments are a bit difficult to make with it. Overall, the Instant Pot Ultra does what it is supposed to do and much more. It allows you to complete ten cooking tasks in the kitchen. Try the appliance out if you get the chance. 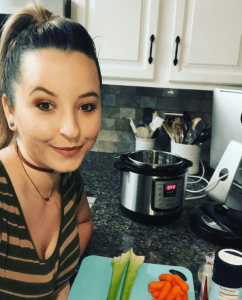 I love the Instant Pot ULTRA model, I am obsessed now!!! Warning if you buy the Ultra Instant Pot model, please be conscious that you must master how to use the buttons due to the fact all the food recipes for Instant Pots are adjusted toward the standard not the Ultra and the buttons on the Ultra are all separate from the standard. 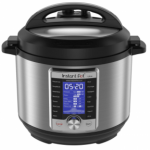 The main difference of this Instant Pot is the dial is so straightforward to operate, simply rotate and push for a specific program you want and customize from there. Overall I believe the IP Ultra is excellent for newcomers and experienced electric pressure cooker consumers. So far it has been a delight to use and I plan to get a lot more use from it. Very disappointed. Do not buy this cooker. Doesn’t operate correctly. This IP electric pressure cooker was deemed to be an upgrade for me, but it is unfortunate horrible. It dosen’t seal the lid, because the silicone sealing ring is too wobbly, producing leaks. As a result of the pressure never builds up. Lastly, I found the user interface to be overly complex and tedious to read except If I bend over to stare at it straight on. I would happily give up all the technology on an Instant Pot electric pressure cooker for regular basic operation. The only must-have trait for me is a saute capacity to brown meats so I will keep exploring other models. Changed the way I cook! I completely love the Instant Pot Ultra. It’s a little complicated to figure out at first but it’s incredibly easy when you figure how to operate it. As long as you use 1/4-1/2 cup water with whatever you’re making (on top of what would be required to normally cook it), it cooks the food considerably well. I have prepared entire chickens, pulled pork and a lentil soup where the meat and chicken were moist and the soup was delicious. One of my favorite features is hard-boiled eggs. Pinterest is your partner if you are looking for inventive recipes. As for now… my new fav kitchen gadget! 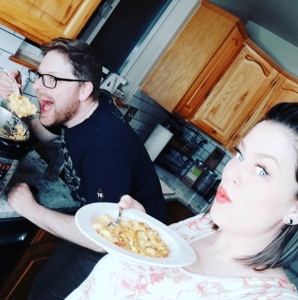 You can cook anything with the Instant Pot Ultra! It’s marvelous! One thing is essential to recognize, the recipes that you use for the instant pot Ultra must follow the instant pot rules. Not everything you find on Google works well. 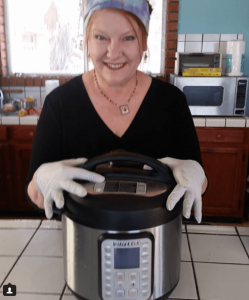 Nevertheless, there are some excellent instant pot groups on Facebook where they know how to use the peculiar steps to ensure that your recipe comes out excellent. The best part for me is that you can brown and saute right in the Instant Pot and then switch to pressure or slow cook, etc. I used to have to saute my veggies or meat on the stovetop then transport to the slow cooker. Now it all falls in the same pot — huge time saver. The pot looks to be well made, and it is a heavy duty stainless steel. I would suggest this pot to replace at least three other appliances. It’s helpful to be able to cook things without boiling water or consuming electricity with the oven.